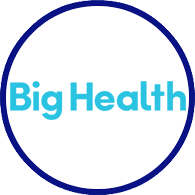 Big Health is a digital medicine company, creating fully automated behavioral medicine programs for mental health that are as scalable as drugs, yet able to deliver outcomes comparable to in-person therapy. Big Health’s first product, Sleepio, is a digital sleep improvement program featuring Cognitive Behavioral Therapy (CBT) techniques designed by Prof Colin Espie (University of Oxford). In addition to helping sufferers make the changes necessary to overcome insomnia, it also acts as a stigma-free “trojan horse” to help improve anxiety and depression at population scale. Sleepio is backed by the world’s leading evidence base for any digital therapeutic, with 30 peer reviewed papers including 6 randomized controlled trials. Under controlled conditions, 76% of insomnia sufferers using Sleepio achieved healthy sleep, and in a clinical audit study 68% of NHS depression and anxiety patients using Sleepio moved to recovery.